February is here and Valentine’s Day is just around the corner! Whether you’re in a relationship or you’re single, Valentine’s Day gift giving can be a daunting task. Not everyone appreciates flowers and your significant other, friends or family members might appreciate something sweeter than those allergy-inducing bouquets. Store-bought chocolates are nice, but I realized after a couple of Valentine’s Day through the years, the ones that have the nicest packaging have the worst taste. Who dares to mess with chocolate?! Kidding aside, these chocolate bars taste like bars of sugar with brown food coloring and it doesn’t seem to be made with love at all–the irony. So, if you decide to partake in this romantic holiday, I’ve put together a couple of recipes that you can make for your loved ones. Most of these are vegan and are guaranteed to taste good (Unless you mess it up!). 1 1/4 cup of full fat coconut milk, fat separated. 1/4 cup of cacao powder, matcha powder, finely ground goji berries, finely ground pistachios or hazelnuts for coating. Optional: 1/2 tsp vanilla extract. In a double boiler, place chocolate chips and melt. Once chips are melted add coconut milk to double boiler and whisk. Continue whisking until completely incorporated, creamy and smooth. Add vanilla, if using (optional) and mix well. Remove chocolate mixture from the boiler and place in the fridge to set uncovered for 2-3 hours. Using a knife, test to see if chocolate has set, it should be almost solid. Once firm, prepare a small dish of preferred coating for rolling. Use a tablespoon, scoop out small balls from the now firm chocolate. 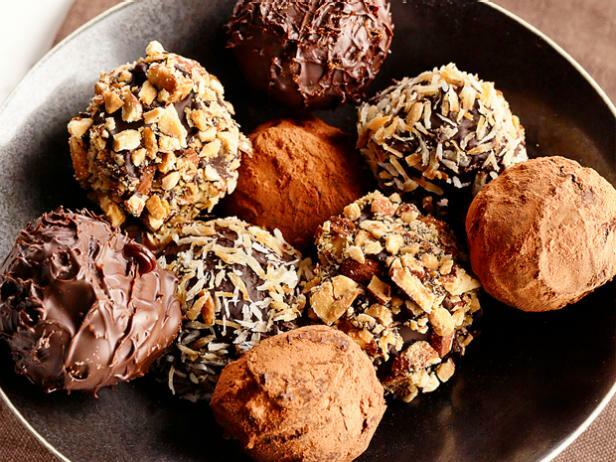 Use your hands to roll the chocolate into balls, working quickly. Roll in the coating of choice and set on a parchment paper-lined dish. Place back into the fridge or freezer for another 1-2 hours minimum to set. Remove from fridge or freezer & enjoy. 4 tablespoons hazelnut brittle You can also sub it with chopped hazelnuts, or use sugar sprinkles or coconut flakes instead. To make the coconut whipped cream, scrape the white solids from the top of the can. Place in a bowl with powdered sugar and vanilla extract. Using a handheld mixer whisk the mixture together until it resembles whipped cream. Strawberries: Cut strawberries into quarters. Mix in a medium-size bowl with sugar and lemon juice. Cover and refrigerate while preparing the rest of the ingredients. 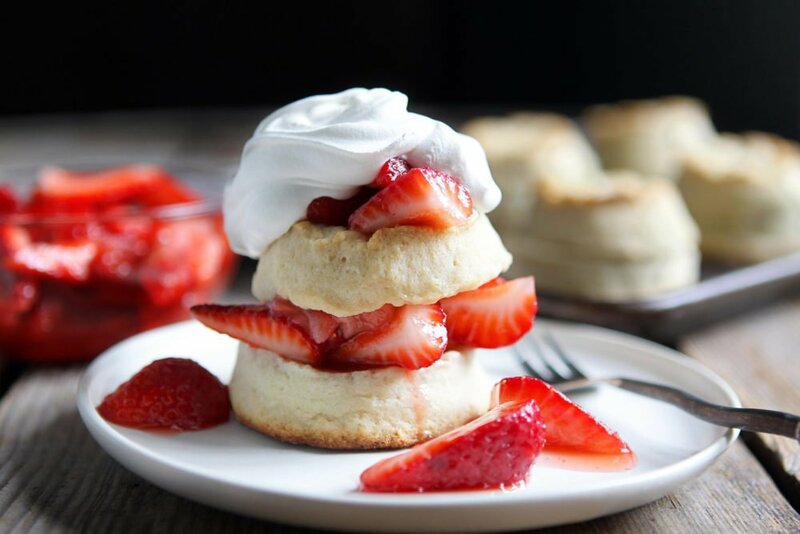 Shortcake: Mix together flour, baking powder, sea salt and cane sugar in a medium-size bowl. Mix together coconut milk and lemon juice in a small-size bowl. If your coconut milk has lumps in it, blend it to make it creamy smooth. Your coconut milk should be cold for the fluffiest biscuits possible! Make a well in the middle of the dry ingredients and slowly pour the milk into the well. Mix with a spatula until just combined. The dough will be a bit sticky but still pliable. Do not overmix the dough or else the biscuits will be tough. Flour your hands and dust the countertop with flour. Pat the dough out until it is about ¾ inch thick and cut out 8 biscuits (using a lightly floured cookie cutter or the rim of a glass). Pat out any corners or unused dough and cut until you have used up all your dough. Transfer the biscuits to a parchment-lined baking sheet. Bake for 12 to 15 minutes until golden brown. Remove from oven and let cool slightly before transferring to a plate. Whipped Coconut Cream: Scoop the thick layer of coconut cream out of the can. Place in a mixing bowl with sugar and vanilla. Whisk with an electric mixer for a couple minutes until soft peaks form (see photo). Assemble shortcake: Layer one large scoop of strawberries and coconut cream on top of the biscuit. Place a second biscuit on top. Garnish with additional coconut cream and strawberries. What’s amazing about these Valentine’s Day gift ideas is that you can go creative with the packaging. Just add red or pink bows or put it in nice looking jars and you already have a very thoughtful gift that you can give to your loved ones for Valentine’s Day. Not only that, but I definitely think that these gifts are made with love! I love to cook/bake and my boyfriend loves it whenever I would give him something that I made. It definitely is made with love! I’m single but I always give a small treat for my family. Like cookies and chocolates. I think this year, this is what I should do. So cute! Nice idea of putting it in jars or cute boxes. I could also make sure that they all taste good and that they’re healthy and not full of refined sugar. This is exactly why homemade goodies are perfect. On point!!! Love does take effort. So I guess it’s really nice if you tell the person you’re giving it to that you made this. My favorite here would be the pots the creme. My idea is putting them in tiny mason jars and putting a ribbon on it. Mason jars with a ribbon are very adorable, Linda! I can’t believe you just made donuts with kidney beans. I’m going to try this later so I know it works well for February 14. I REALLY LOVE your recipes! You are adorable and have great content. I LOVE your blog! I made the strawberry shortcake. I added a can of strawberry fruit filling and the cake turned out great taste really good. OMG these look insanely delicious!! Do I need to buy a doughnut tray to make your amazing doughnut recipe? Thanks for sharing these great recipes! I’m always looking for vegan alternatives! Wow. Those doughnuts seem almost too easy to make! Definitely going to give these a try for breakfast with our girls this weekend﻿. Rebecca, what a delicious cake recipe this is. I would love to try this on my own someday. These look bomb. I love making truffles with some coconut but these ones look easier. Nice job! What an awesome recipe!! Thanks for this! I’ve needed to find a really good vegan cake recipe, and I can’t wait to try this one. Brilliant! I am definitely trying these soon. I have been looking for this type of recipes for years. 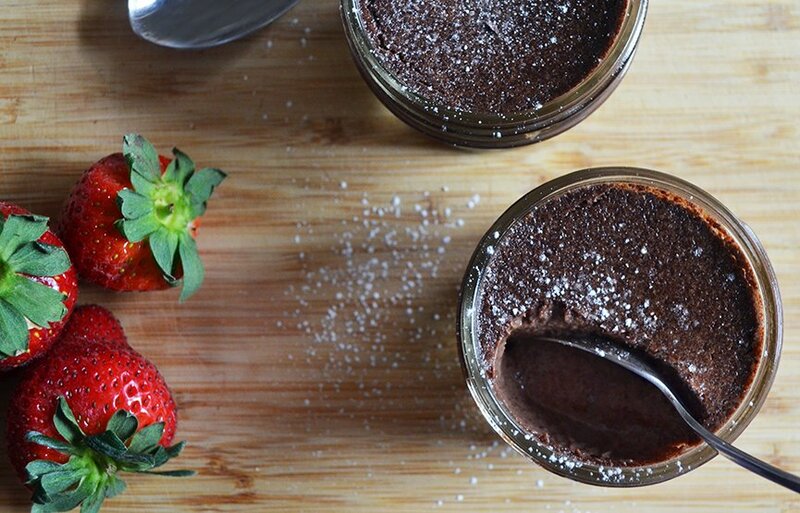 I’ve made your chocolate pot de creme recipe and its divine, everyone loved it! You have no idea how thankful i am that all of your recipes are Dairy free. keep up the good work. I was just talking about how much I miss donuts on friday and then boom! Here’s the recipe lol. Okay, I will need my elastic pants for these great recipes! Thanks for sharing! Yummmmmmyyy!!! I’m SO excited to start making awesome vegan truffles for the holidays! Thanks. Those donuts look so delicious! 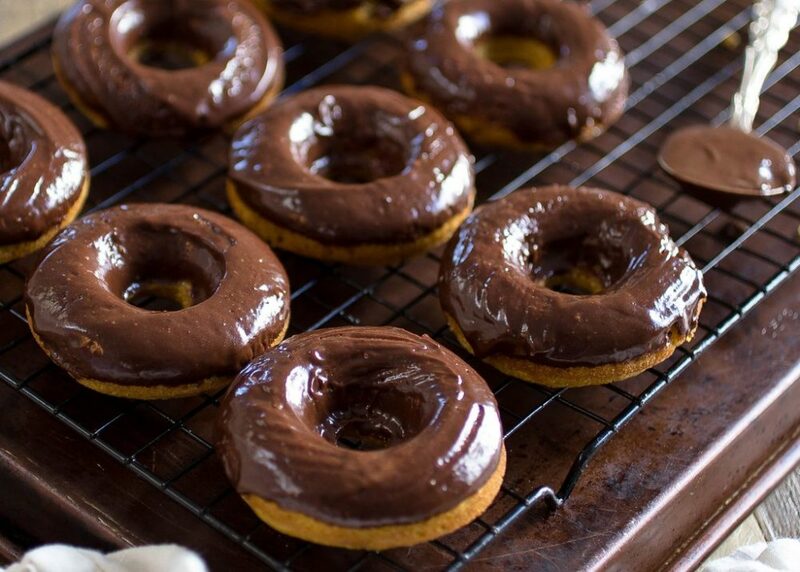 Definitely gonna try this recipe!﻿ Those are my favorite kind of donuts and they look delicious﻿. These recipes have such great timing for me as I have a guest arriving today and need a quick simple dessert to welcome them with! Thanks so much. They look delicious﻿. Omggg!!! I’m drooling!! Need a snack. haha and one of these would make my day! Thanks for another set of delish recipes. This shortcake has a great look! Oh man, I am ready to eat one now. Thanks for writing and, as always, I am inspired by your recipe. This blog is incredible. i made some great healthy delicious meals inspired by these. i have a question! if i wanted to make my coating chocolate thinner ( and vegan of course) what should i do? the chocolate i make is not very runny﻿. I am definitely going to try these in a couple weeks. I was planning to make Raw Brownies. Maybe I’ll vary it up with your truffles too. I hope they look as pretty as yours! Wow, this pots de creme sounds so good! I would love to try this sometime. Thank you for sharing it. Goodness! I simply must make this vegan strawberry shortcake! Looks great and easy to make. I made this strawberry shortcake for valentine’s day… It was incredible! Can’t wait to make it again. These look so delicious and so easy to make unlike some vegan desserts I have seen on other blogs that look complicated and too time consuming. I love how you use simple ingredients most of which I usually have and use regularly! So look forward to making these! Thank you! Oh my goodness those doughnuts look absolutely delicious and tasty I want one of those now. i just wanted to say, i really appreciate how you give different options for doing things. it’s a welcome change from most other tutorials, which seem to assume one needs a kitchen full of gadgets to make anything nice. so, thank you! I’M SO HAPPY THIS IS VEGAN . I’m vegan and im always looking for delicious recipes, thanks. All of it looks soooo good! If some people don’t like it, then go back to your burgers and fries… This is a real healthy dessert!!! OMG! Epic desserts!! Who cares about the fat when you are making a cake like this! It’s probably as healthy as a tiered cake would get! I will save this recipe for a special day. And go all out! These look freaking amazing. I can’t wait to try them!! How often do you eat treats like this (or your other desserts)? Where does it normally fit in with the rest of your meals? Do you eat them in between meals, or after a meal? Love this so much girlie! They look so amazingly delicious I think i am putting them on the to-do list for our valentine’s day date night! I had made this yesterday and refrigerated overnight. It came out very nicely!! It wasn’t too sweet but chocolaty and very creamy!! Yummy! Thank you! That looks aaaamMMMAAAZING! Kind of like a cake version of those strawberry eclair ice cream bars. I can’t wait to try this. Wow, those look really good! you’re awesome! thanks for sharing these recipes with us. Nice creation, but too much fricken detail. Just wack on the cream and shove some strawberries on top and it all tastes the same in your mouth. These look amazing. I’ll be making these this weekend for my family, cause I’m single. My family will love them for Sunday breakfast. You are one of those humans who actually came from heaven, right? I’m pretty sure you are because these donuts are a God send! I made these this morning, and they’re amazing! Not bitter at all, the sweetness with the ground goji berries is just right. I wrote out the recipe to add to my recipe box. Ohhhh that Pots De Creme… 😍 I kept saying I wanna make this but I haven’t! I need to do this soon.. But I’ll have to get a roasting pan.. My oven is horrid. I might as well get a new oven. I don’t have a Valentine either, but I have friends that appreciate tokens of friendship. That’s okay, girl! Vegan desserts are really yummy. Contrary to what others think that it doesn’t taste as good. These recipes are super cute!! College-friendly recipes would be cool! Or things that don’t require a lot of extra equipment to make, like mixers or blenders. I am, soooo hungry right now. And i just finished eating dinner. Can you imagine how delicious these look right now? I would have strawberry shortcake every year for my birthday but now that i’m raw this will make an exceptional replacement!! I recently made these. They were so easy and delicious. My whole family loved them. thank you!! WOW! This is the most healthy, beautiful strawberry shortcake that I’ve ever seen!!! This is the REAL Strawberry Shortcake! I love strawberries and strawberry shortcake. I want to try this recipe soon!! Thank you so much for sharing this gorgeous recipe! You are a RAWkin’ chef! 😉 I love you! Hugs! Thanks for sharing your recipes. I would make that cake for a dinner party; but, I couldn’t eat it because of the sugar. I use dates, for the cake I would eat. Could you please make a cake that is FILLED with a huge variety of nutrients, but is also with delectable flavor? I’m confident that you could blast this one out of the water. Your recipes are just amazing and delicious but most of all healthy, nurturing in all kinds of nutrients we need to keep healing in staying healthy in a much more fun and enjoyable and exciting way of living healthy, thank you so much for being you in being so passionate about real food. Chocolate is the reason I’m alive, my blood is cherry and chocolate ganache, my body breathes in South American Cocoa pods, trust me I could go on. I don’t like chocolate but my husband does so I may try it. Any reason it wouldn’t work substituting the chocolate with vanilla or butterscotch? Your recipes are amazing! If you bundle all your recipes in a cookbook, I would be interested. I think I just died and went to heaven. This looks so delicious and scrumptious! I must make this one SOON! Thank you for the quick easy ideas!!!! Would love to see some healthy fully plant based meals!! Maybe some breakfast ideas?? I’m going to make the pots de creme. Should I wait till it cools completely before putting it in the fridge or I should do that as soon as they come out of the oven ? This is great! It gave me an idea to make something similar with what I had in my pantry. Just used Dates, Peanut butter, Coco powder, cacao nibs (for crunch and more chocolate flavor), and Mexican Vanilla extract (a large bottle I keep for all baking!). I loved this! These recipes are so simple but they look so cute and yummy! I’m a vegan, gluten and dairy free so I’m definitely trying some of these. I can’t wait to try making these. I’m super excited!! These were my all time favorite donuts! I’m going to make these!! You put so much time and effort into these wonderful and HEALTHY recipes! This is gorgeous! Can’t wait to make this. Could I cook the Pots de Creme in a giant ceramic dish for a large party instead of little individual ones? Will it be the same outcome? Thank you for sharing these recipes with us. I have recently been diagnosed with Non Celiac Gluten Intolerance. It has been kind of hard because my biggest weakness is chocolate. Seeing a blogger I trust make these has really made my day! I will be making these as soon as possible. Can’t wait! Vegan pots de creme are my favorite. Although the plain one is also nice, chocolate sounds good. My husband will enjoy this. He likes this better than the traditional chocolate that are store-bought. This is sweeter! Love these recipes so much! I’m just not sure if I can find all these alternatives in the nearby shops here. THAT CAKE OH MY THIS LOOKS ABSOLUTELY… I CANT EVEN THINK OF A WORD TO DESCRIBE HOW DELICIOUS THIS LOOKS!!!!!!!!!!!! I have to try this. I am in love. you have no idea how thankful i am that all of your recipes are dairy free. keep up the good work. Who else is going to make these and then eat themselves? These dessert ideas are so cool. I am always confused about what should I gift on Valentine’s day thank you for this million dollar ideas. Perfect timings!! Was planning to go for shopping. Thank you for saving my money. I am going to make these for myself. Your valentine’s day recipes are simply divine. I wish somebody would give me this yummy dessert instead of that crappy chocolate. Thank you so much for coming up with these delicious recipes. I always wonder what could be the best valentine’s day gift I can give someone and finally I have found one. Wow!! So many dessert, so little time I can’t decide which one I am going to make. I am so happy that you made this. I am vegan and I am so glad I can make a vegan dessert. Thank you so much. My friend is vegan and I can finally gift her something vegan this valentine’s day. I am definitely going to make Vegan and Gluten-Free Chocolate Truffles. They look so amazing and so good. Love how simple your recipes are, literally only a few ingredients. You always come through with the healthy recipes. And I am happy that Valentine would not be an excuse for not eating healthy. Perfect chocolate treats for valentines.